Laura and I are trying a formal Honey-Do List. We’re both very task-oriented people and we really like lists. There are a lot of things I can do to help with Charlie but have to wait until I get home from work. Vice-versa, stuff I’ll think of while I’m at work that Laura should take a look at on the days she’s home. We probably should have done this a long time ago but even suggesting that one of us ditch our to-do app of choice would have been blasphemy. I switched to OmniFocus this year and you’d have to pry it from my cold dead fingers. Laura really likes Remember The Milk [RTM] but I’ve never cared for it. One option was just use another app just for the HoneyDo list. The front-runner would be Wunderlist. This would work… but meh. This would mean another slot on our coveted iPhone home screens. A space we didn’t want to give up. I personally would have trouble remembering to go into it. If it’s not in OmniFocus, it’s not in my world. Neither OmniFocus or RTM have the ability to do 2-way sync. But, they CAN take in tasks through email addresses. Ok, there is a way for tasks to get into our respective worlds from somewhere else. Check. The next step was to have something be the single point of entry for tasks. This entry point would also serve as the aggregate list of both our worlds. 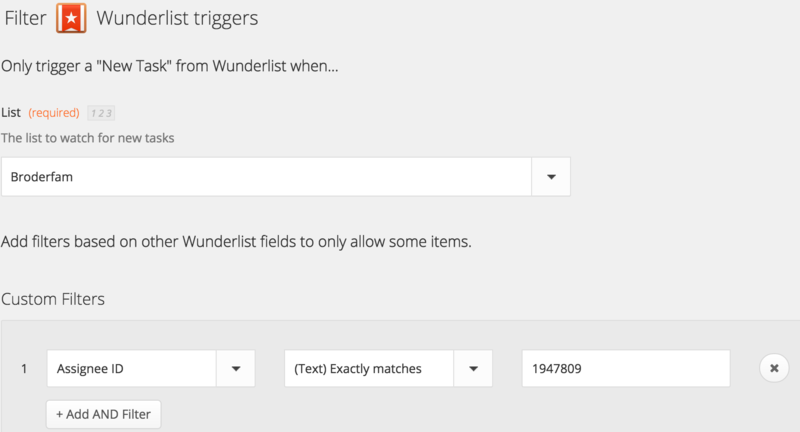 Wunderlist and Todoist both have great API’s, there had to be something. There was also a good chance that IFTTT or Zapier could connect to everything. IFTTT was a bust, but Zapier hooked us up. I went with Wunderlist because Todoist’s notifications are a premium only feature. We’re not sure if we’ll actually use the notifications, but I didn’t feel like switching if we decided to in the future. 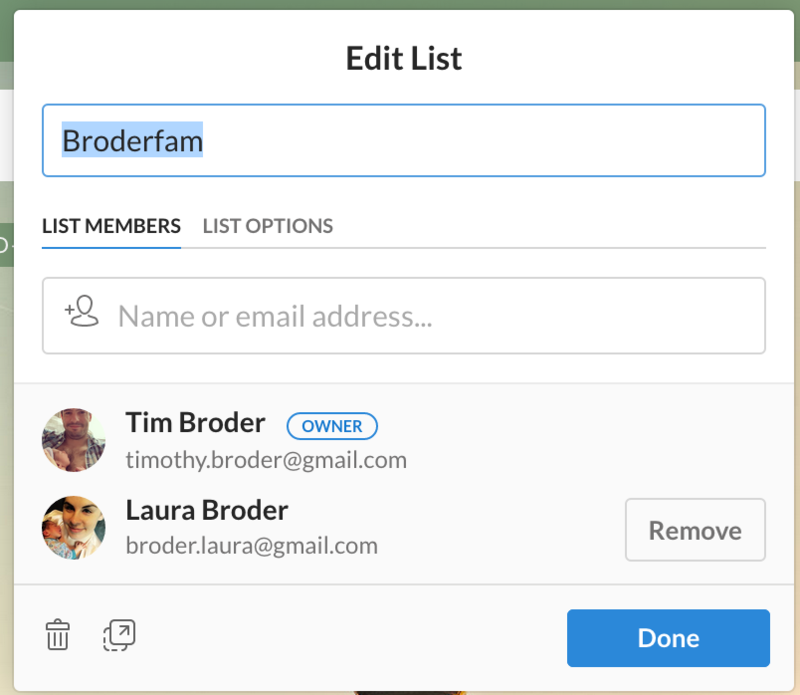 Wunderlist could also handle shared lists, asignees, and due dates. Test the Zap and turn it on. 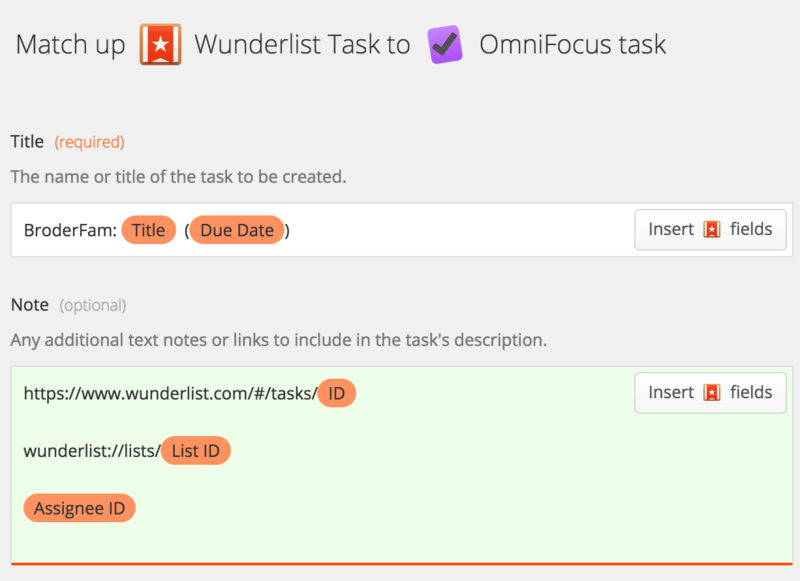 Now, any task that goes into your list will go to OmniFocus. But, we don’t want that. We only want the ones that are assigned to me.